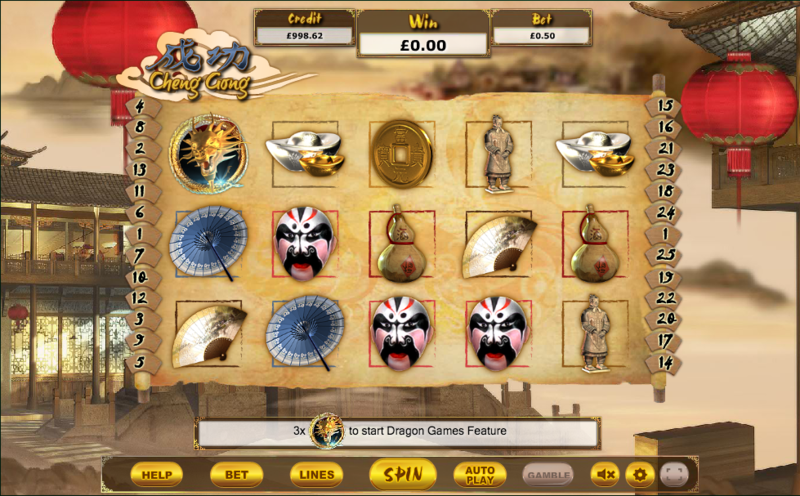 As all online slots players will know, Cheng Gong is a rough translation of the English word ‘succeed’ and with a bit of luck and a fair wind, success is what we’ll have as we check out this good-looking game from Eyecon; it’s theme is oriental and it offers players several bonus features and a chance to gamble those winnings. Cheng Gong is a five reel slot with three rows and up to twenty five paylines; those reels spin on a piece of unrolled parchment while red lanterns float from above; in the background there’s a building high up in the clouds to accompany the gameplay, along with some appropriately Chinese music. The symbols are all related to the theme and include a statuette, a water container, a gold coin, gold/silver ingots, a vase, a mask, an umbrella, a gourd and a fan. The princess is the wild symbol and she’ll substitute for all others except for the dragon and red lantern scatters; she will also double any wins to which she contributes. This is triggered by landing three or more of the princess wild/scatter symbols anywhere on the reels; you will now see two fans and must pick one to reveal a prize. Finding the ‘bonus pick’ will award a another selection up to a maximum of three. Trigger this by landing three, four or five of the red lantern scatter symbols anywhere in view for which you will receive five, six or seven picks in the next stage. Each pick will reveal up to six free spins or a maximum multiplier of 3x. 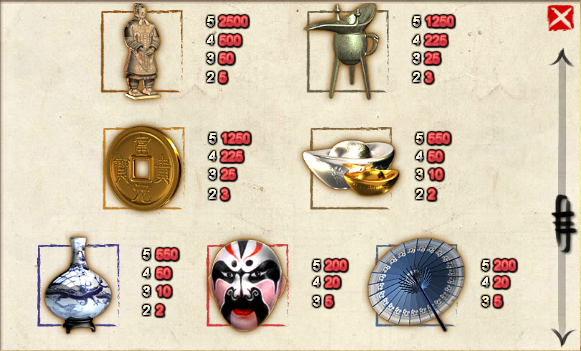 When this is done the free spins will begin. Trigger this by landing three of the dragon scatter symbols anywhere on reels one, two and three; you are awarded five free spins with the first three reels (and the scatters) frozen in place for guaranteed wins. Landing a dragon on reels four and five will freeze those reels also. Each win can be gambled in a double or nothing game accessed by pressing the ‘Gamble’ button below the reels; here you pick the red or blue umbrella up to a maximum of five correct guesses or £32k but a wrong guess will lose it all. Cheng Gong is a nice addition to the lengthy list of oriental slots – it’s designed to a high quality, it comes with lots of extra features and a reasonable enough RTP of 95.30%.